The best seat in the house - or city - belongs to Altius. 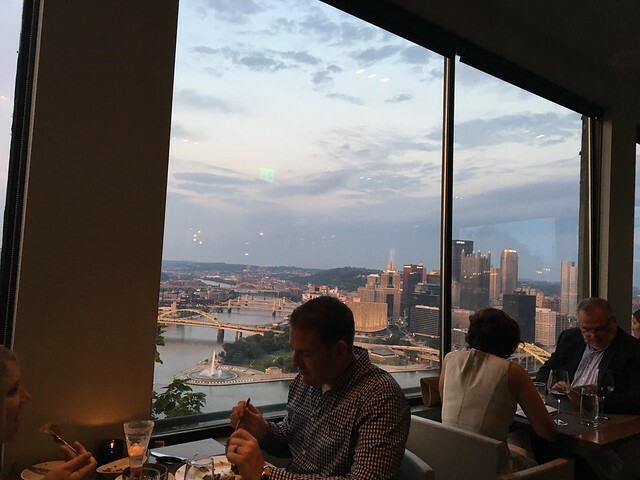 The Pittsburgh restaurant sits atop Mount Washington, overlooking the beautiful buildings and rivers that converge in the center of the city. Altius translates to 'higher' in Latin. 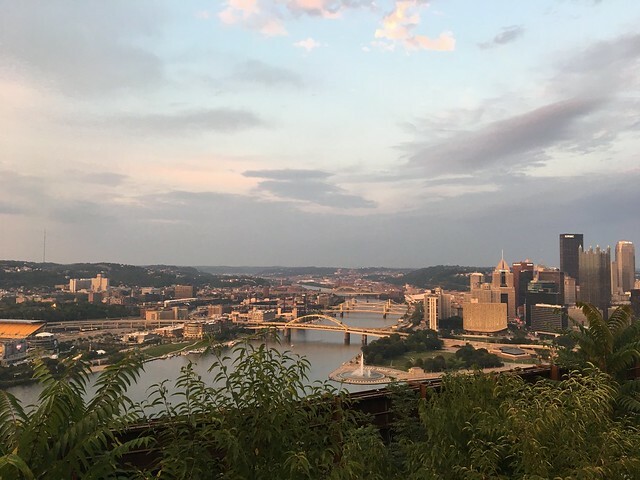 The name speaks not only to a location overlooking the City of Pittsburgh, but also a desire to offer a fresh new concept with higher standards for food quality, creativity, design and hospitality. 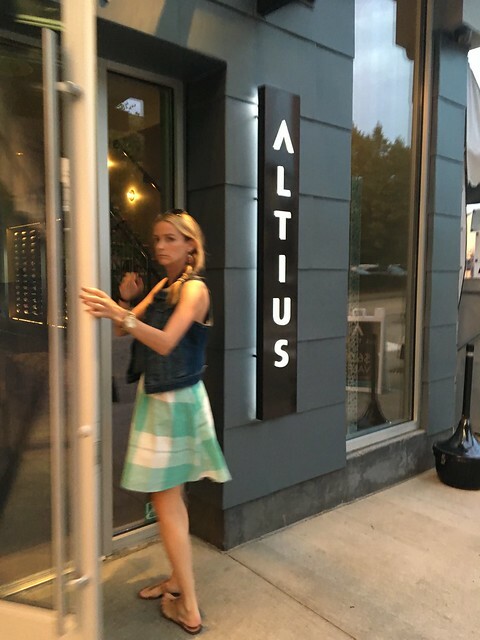 Altius strives to use environmentally responsible practices in all aspects of operations, including the use of sustainable, organic or local products when possible in both cuisine and libations. It's important to make reservations - and I found this out as I tried to look a few days before we wanted to go and found nothing available. But, I lucked out the day before and saw a dinner slot opened up! And while you can't reserve a window seat, we ended up pretty close. The dress code is dressy casual, but it's clear this is more of a special occasion restaurant. We saw some folks at the bar wearing jeans, but most everyone else looked to be professional or celebrating anniversaries. 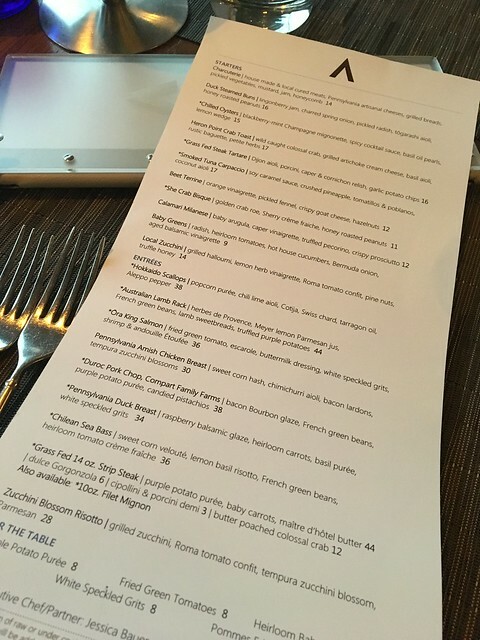 "The chef-driven menu features the very best our region has to offer and features seasonal, sustainable products whenever possible." The menu has a little bit of everything: duck steamed buns, oysters, beet terrine and grass fed steak tartare for starters. Entrees include options like scallops, lamb rack, Chilean sea bass and zucchini blossom risotto. And, they have options to share at the table: purple potato puree, white speckled grits and fried green tomatoes. Chef Jessica is always on the hunt for America’s truly great foods, such as Berkshire pork, artisanal gorgonzola, and grass-fed beef. 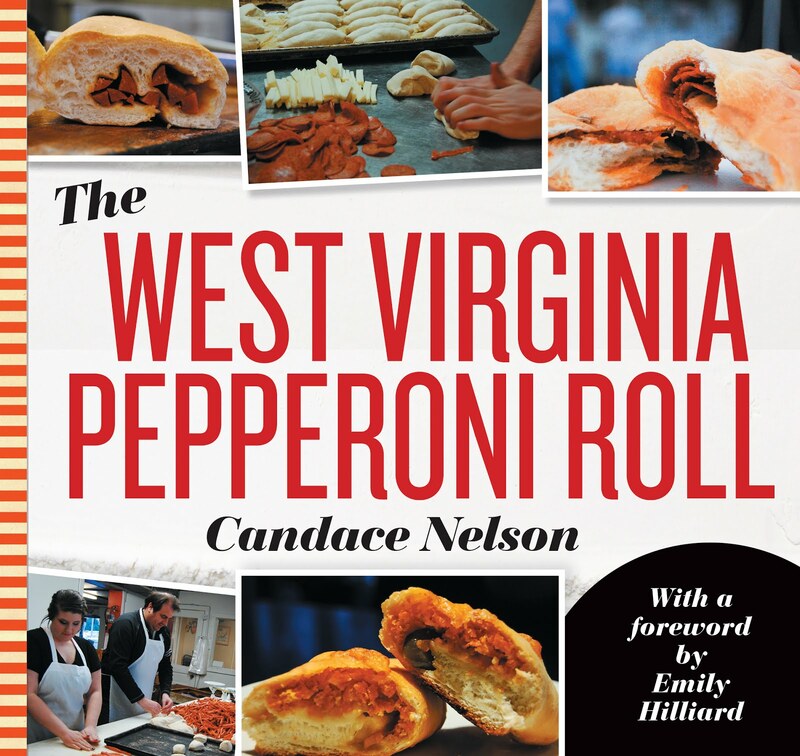 Her menu ranges from fun, whimsical dishes like “Duck, Duck, Goose” and “Tongue n’ Cheek” to approachable, familiar dishes. Finally, in always keeping our guest’s needs at the top of our minds, we offer healthy, creative dishes including gluten-free and vegetarian options. 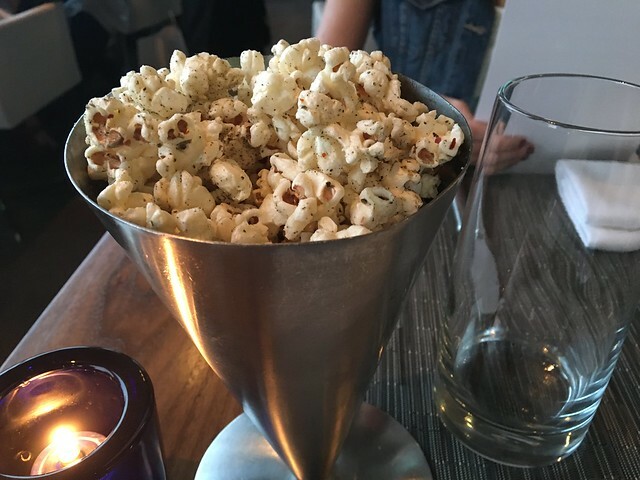 But, before any of that, we were served popcorn. Yes, popcorn. This is a complimentary gesture that changes daily. On this day, they offered breakfast sausage popcorn. And, yes, it really did taste like breakfast sausage. It was a light bite with a heavy flavoring - definitely interesting. THEN, more gifts. Fresh bread. The fresh bread service is one of my weaknesses at any restaurant. It's this old-school treat that isn't offered much anymore, so I'm giddy at the thought - especially when it's good bread, which this was. 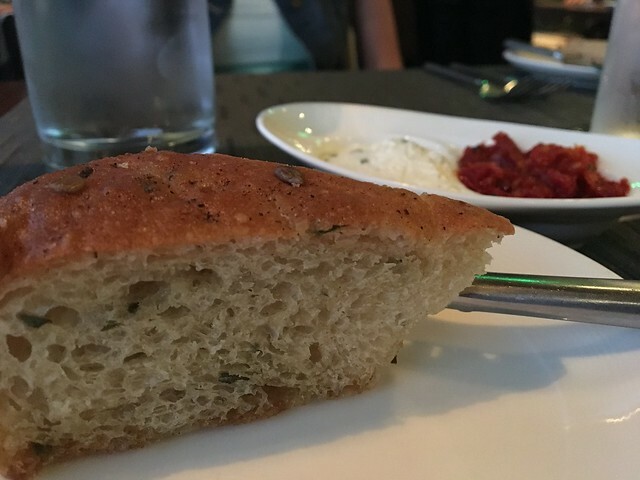 I took the server up on the rosemary chive focaccia, which was complemented with a delicious garlic butter and sundried tomato pesto. Both were just fantastic. BUT WAIT, there's MORE. 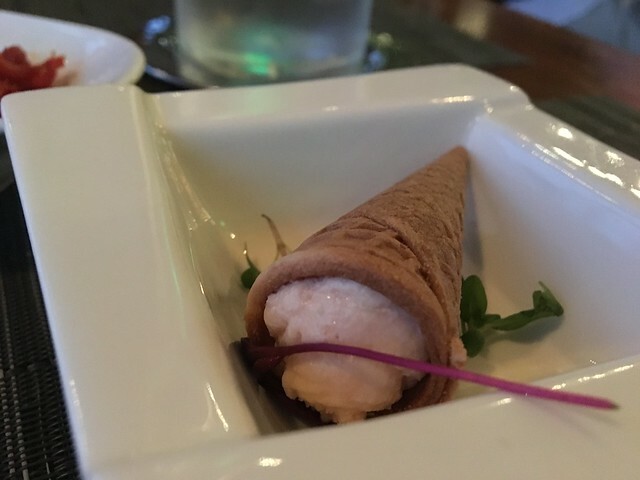 A small gift from the chef came in the form of this goat cheese cone. This was entirely unexpected, but wow - it's just like a nice creamy goat cheese on a cracker. But, in this case, it's wrapped in the cracker. A really lovely, light first bite. 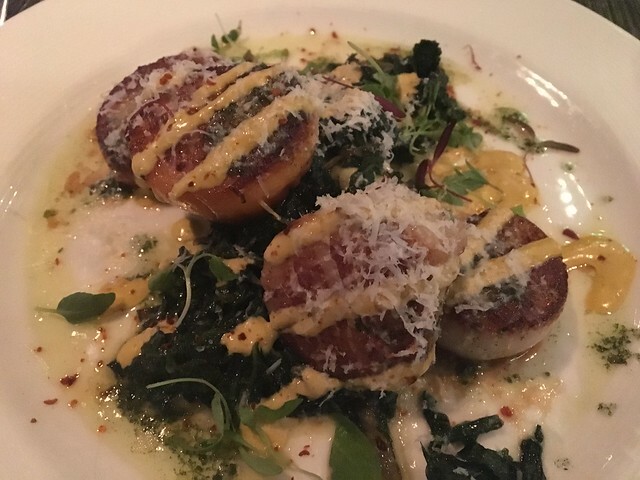 OK, now let's move on to entrees: I ordered the Hokkaido Scallops, which came with popcorn puree, chili lime aioli, Cotija, swiss chard, tarragon oil, and aleppo pepper. I was a little surprised to see so much ~stuff~ on scallops. They're a pretty delicate flavor, and they usually shine all on their own. That said, I don't hate the additions because, hell, they taste good. This was really good. 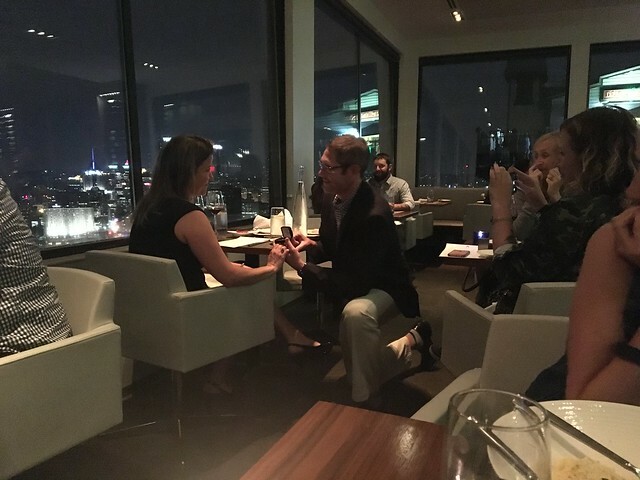 I now interrupt this post to say that I saw a proposal happen! It was right across from our table, and my mouth dropped open when I saw it happening. 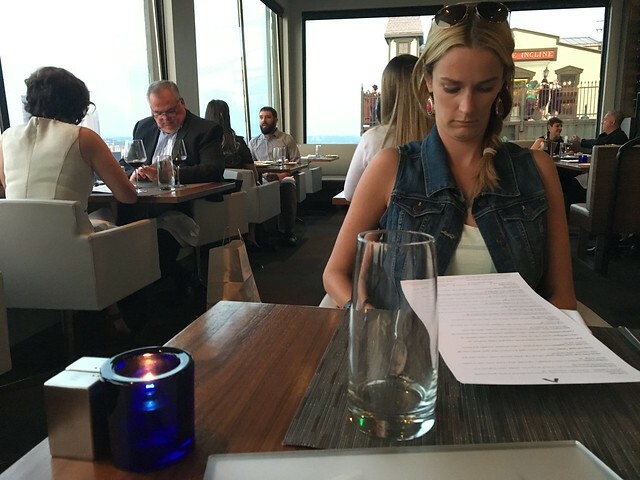 That was sweet, and it was a nice moment where the entire restaurant applauded. OK, back to our regularly scheduled blog post. 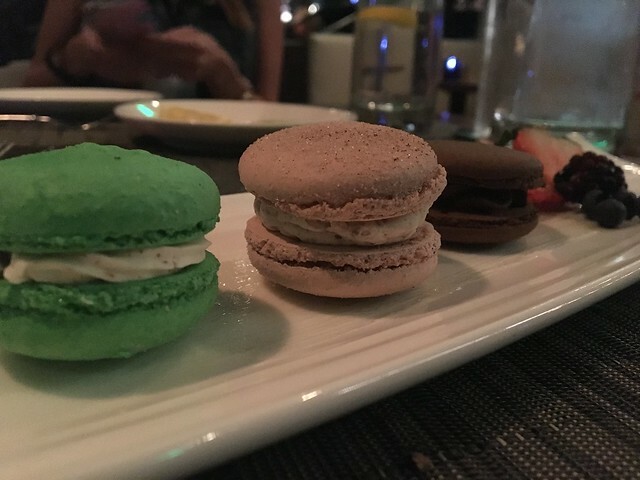 For dessert (somehow I was still eating), I ordered the macarons. The are three, chef's choice. On this day, they were a cinnamon apple, maple pecan and chocolate cherry. The maple pecan was quite good, and the others were decent. Macarons are difficult to make, and they're not found in many places in Morgantown so I always get excited to try them when they're available. Pretty good. And, we had a little gift to take home. 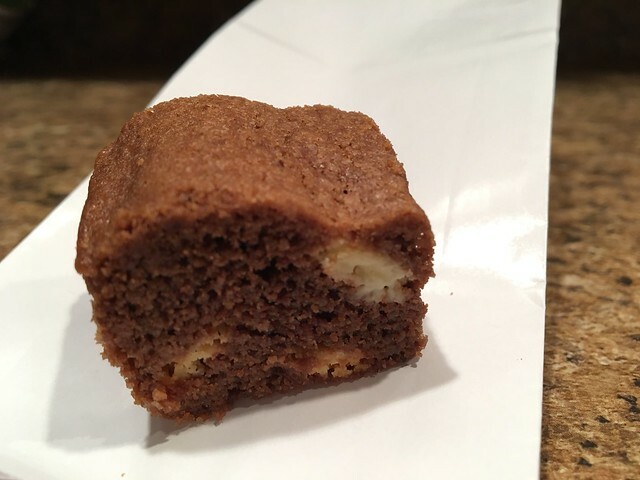 A toffee, chocolate cookie. I think this is such a special touch because it keeps you remembering that experience after you're home. It's more than just a meal, it's a memory. 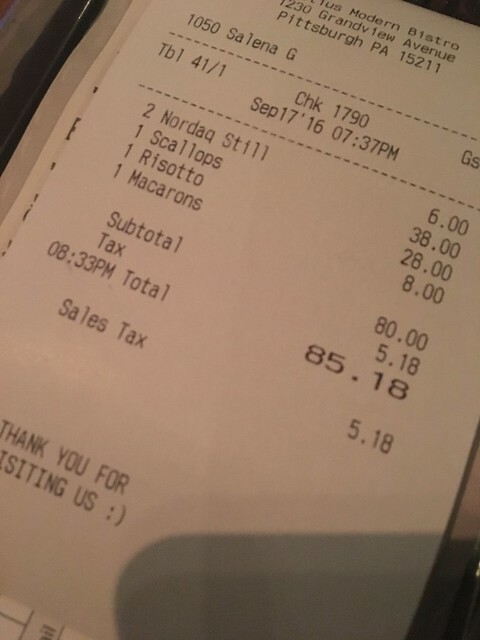 I didn't even touch on the incredible service. Servers crumb tables and tend to napkins, and my water never ran dry (even if it did cost $3). Again, they are crafting an experience, and it works. It's clear this restaurant is the ultimate crowd-pleaser (see here and here and here). I don't know that it's entirely inventive with its options - and I know that's intended to please a wide audience -, but I do know that I had some damn good food, incredible service and a lovely time. 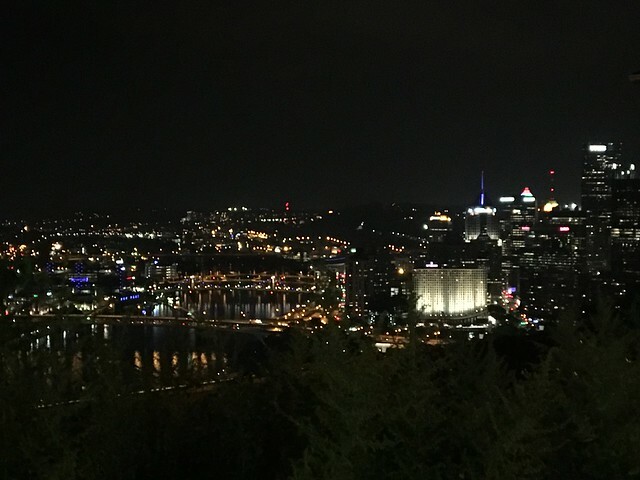 I think it's a great option for a celebration dinner with some of the best views of the city.